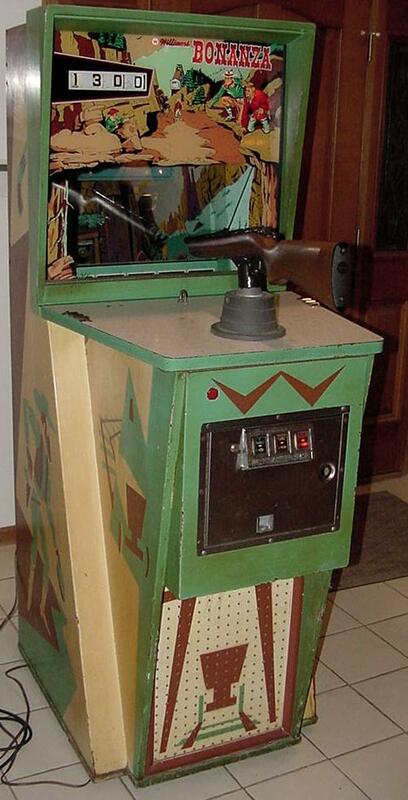 Both the gun shot sound and mine shaft explosion sounds are the same sound, made by the Muntz tape player. The difference between the two sounds is for the Mine explosion, the gun shot sound is fed thru a phonograph needle cartridge which is connected to a long spring. 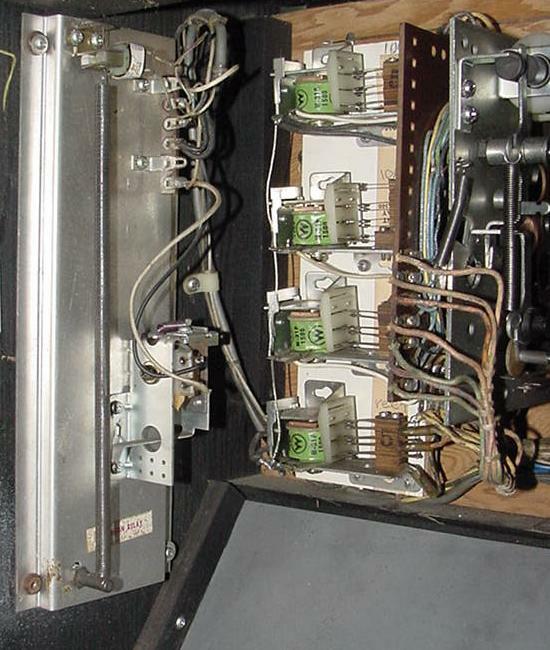 A relay momentarily "kicks" the spring, which gives the gun shot sound a reverberation, making it distinctly different than the non-reverb gun shot sound. Pretty well thought out, as the Muntz tape player only makes *one* sound, but it's manipulated by the EM side of the game to sound like two distinct sounds. But if the Muntz tape player is missing, neither the gun shot sound or the mine explosion sound will be heard. 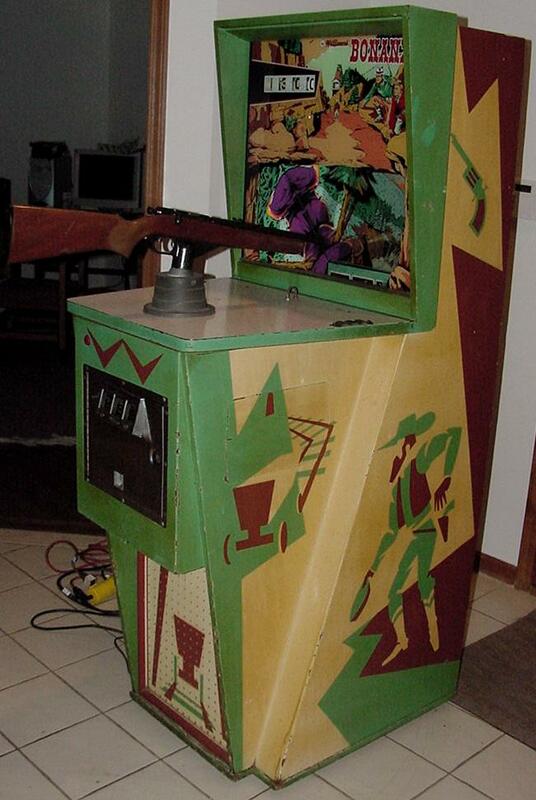 Behind the front lower kick panel of the game there are two speakers and three volume controls (one for the background hoof/horse sounds created by the 4-track tape, one for the explosion sound, and one for the gun shot sound). Because of this, the Bonanza tape player is very integral to all the game sounds. There is also a bell for hitting the slow horse (but not the fast horse). There is a 120 volt recoil solenoid for the gun. #455 flashing bulbs are used to give a muzzle-flash effect, like there are hidden desperados shooting back at the player. For a nicer effect, I dipped the eight #455 bulb into red lacquer to give a red muzzle flash effect. A fast horse goes across the top back of the scenery. This is worth 100 points, or 500 points when lit. 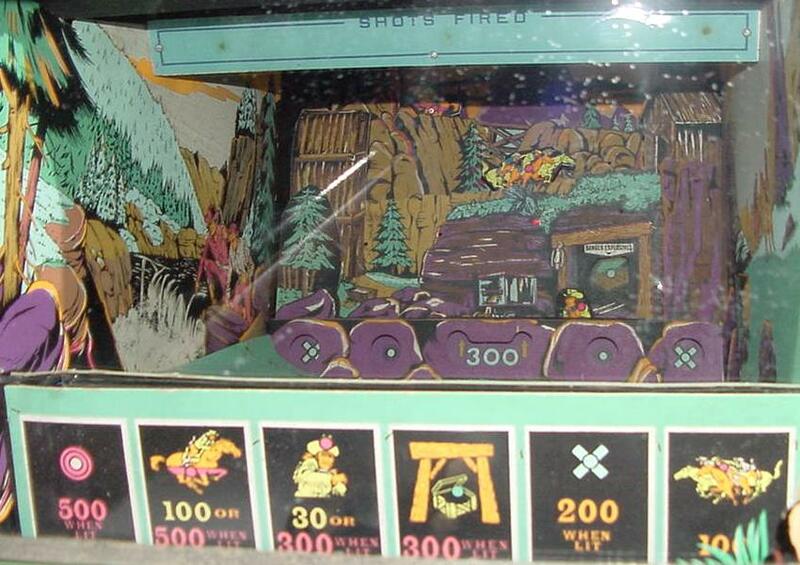 There is a slow horses target that moves across the middle of the scenery which is always worth 100 points. 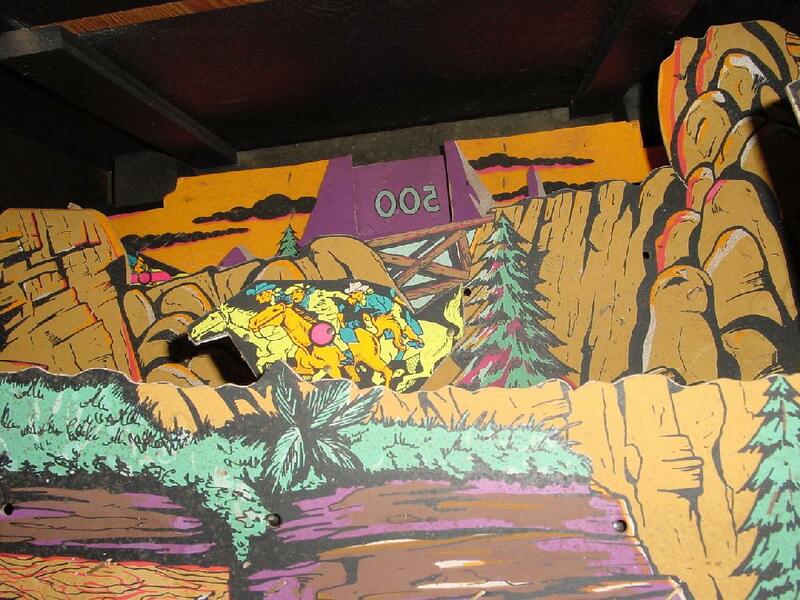 The men that pop up vertically across the bottom of the scenery are worth 30 points, except for the center man which is worth 300 points when lit. The lit stationary treasure mine is worth 300 points, and this creates the mine explosion and a flash of a red 120 volt light bulb. "X" stationary targets also light which are worth 300 points. Extra shots are awarded if the player gets to a set point level (operator selectible for 3000, 4000, 5000, 6000 or 7000 points). Since my game was missing the Muntz tape player (and hence the gun shot and mine explosion sounds), I changed the bell sound on my game. Instead of using the bell just for the slow horse hit, I wired the bell to the 100 point relay (by adding a switch to the relay). I added another bell and connected that to the 10 point relay. I also added a $15 Sony DCM-929 "shoebox" cassette tape player to the game. The good thing about this recorder is it runs at 6 volts DC (using a power adaptor). 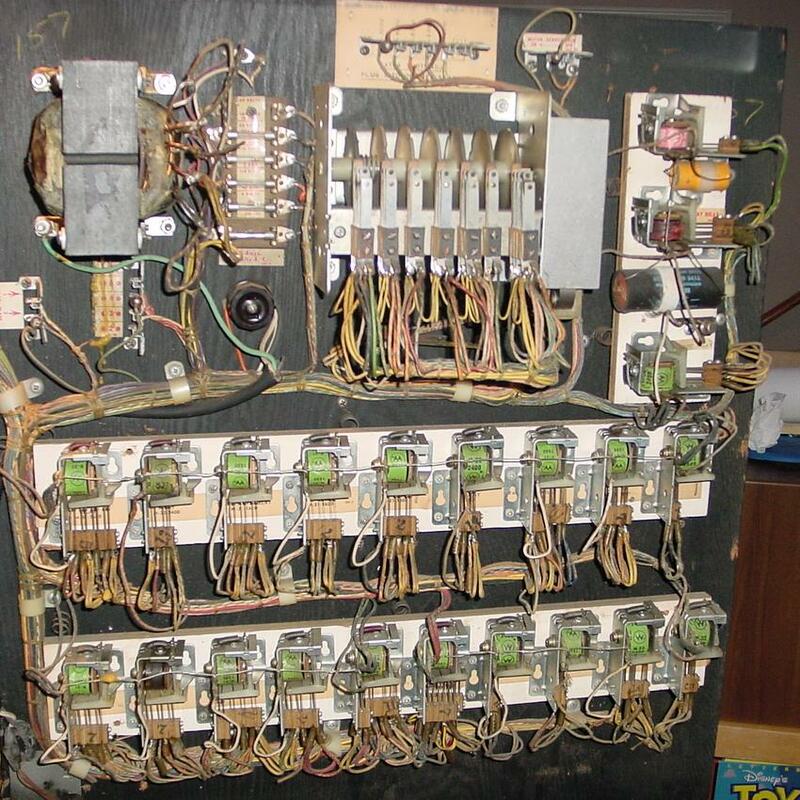 So I just wired it to the "return shots" 6.3 volts AC power plug thru a 35 amp 200 volt bridge rectifier (with a 10,000 mfd electrolytic cap across the "+" and "-" leads of the bridge). Just cut off the adaptor portion of the power adaptor and use the Sony wiring and plug to the tape player. 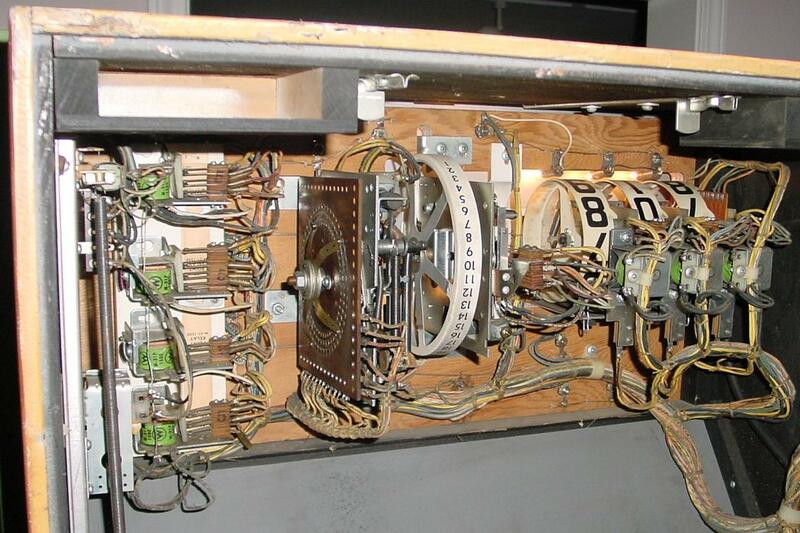 This will make the tape player only turn on when the game is played. Next I wired a jack to the Sony's speaker wires (and disconnected the Sony cassette speaker). 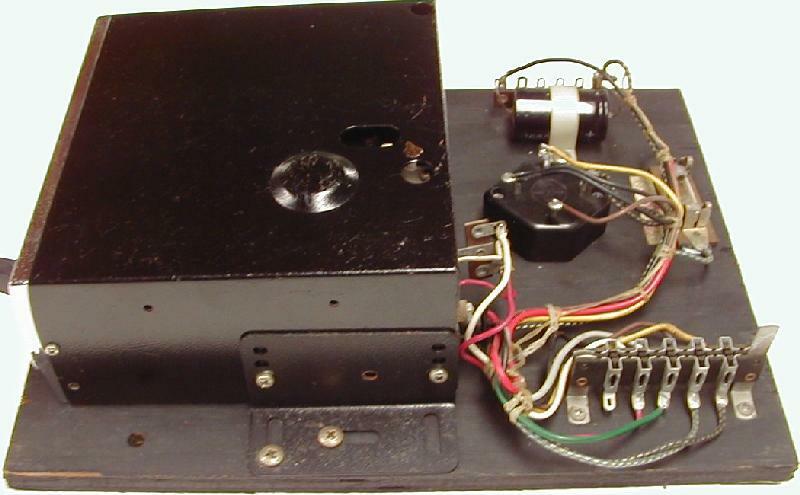 I then wired this to the original Bonanza speaker, and put the volume all the way UP on the cassette player. Then I recorded the Bonanza tape track (thanks to Mark C.) to a 3 minute endless loop cassette tape, and left the player on "Play". The Sony DCM-929 can even be used to record the Bonanza sound track as it has a microphone jack. 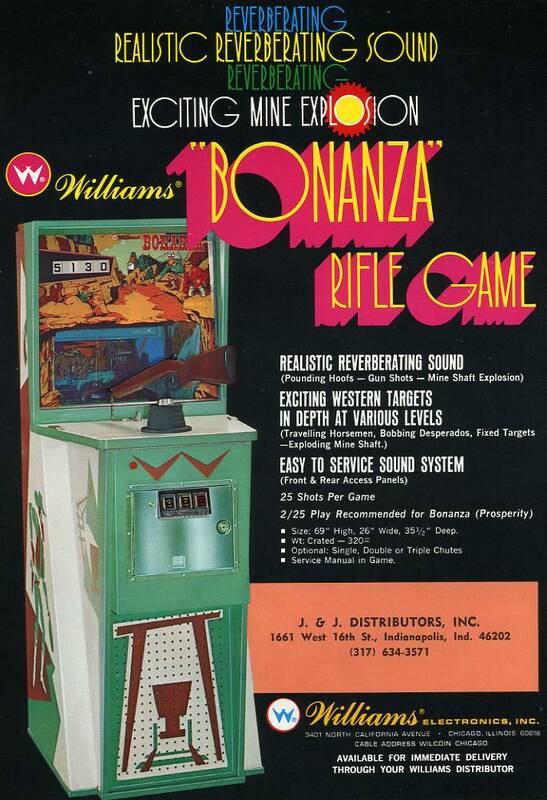 Now when a game starts (and the 6 volt AC power automatically turns on), the Bonanza tape plays on the original front Bonanza speaker. Even the original Bonanza volume control works! This was a nice compromise for the missing Muntz tape player. The only sound lacking is the electronic gun shot sound. For my Sony endless loop cassette, I made a three minute version of the original Bonanza sounds which can be downloaded here (5meg, MP3 format). I also made a three minute version of the TV Show "Bonanza" theme song combined with the Bonanza game's soundtrack whick can be downloaded here (5meg, MP3 format). 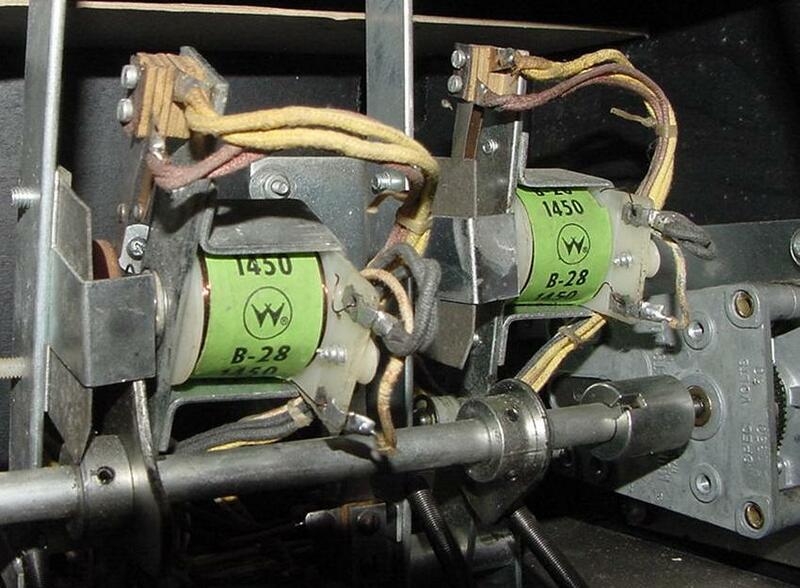 The missing tape player mounts where the two wing nuts are seen in this pic. The 100 point slow horses target is seen here. The mine explosion spring/phone cartridge and relay. killed target quickly. 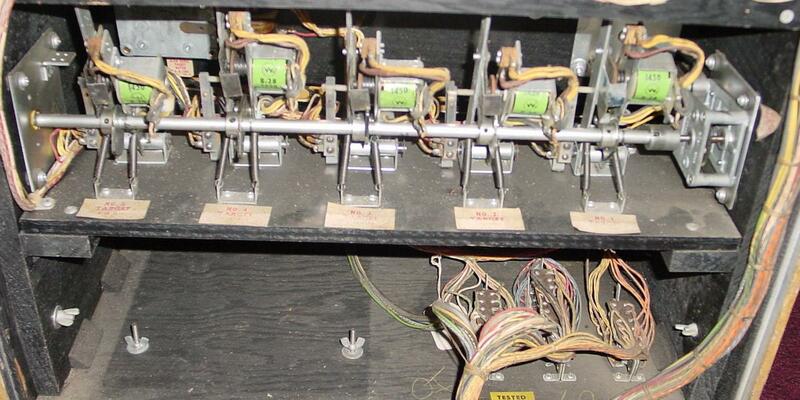 The single switch on the mech controls the scoring. not be closed at any other time (regardless of the target's position). Here's the Sony DCM-929 wired to the Bonanza, with a three minute endless loop cassette tape. 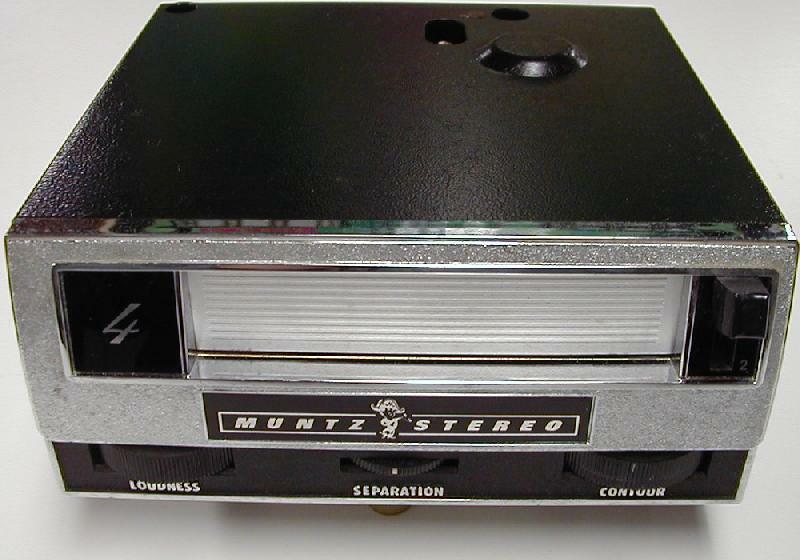 The original 4-track Muntz tape player used in Williams Bonanza. 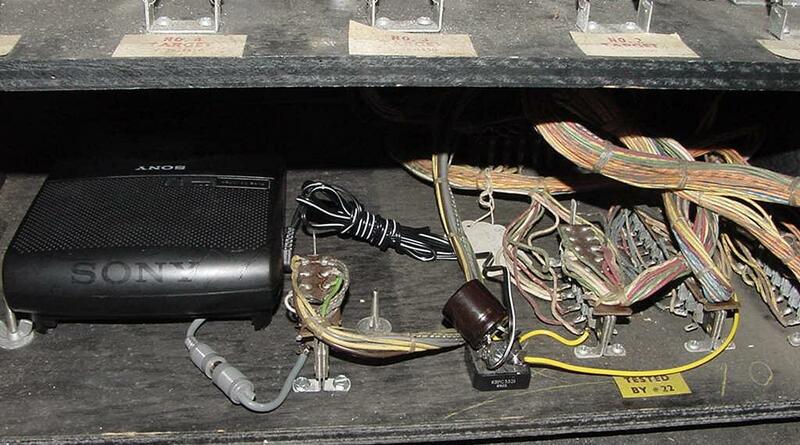 You can see the bridge rectifier and capacitor which is similar to how I wired the cassette deck above.